A very common native perennial species of wet acid soils and moorland, lakeshores etc. 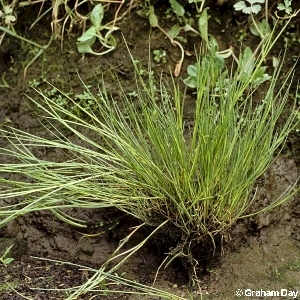 Generally rather shorter than the somewhat similar sharp-flowered rush (Juncus acutiflorus) and frequently only a foot or less in height, of a somewhat darker green, with leaves that are oval in section and curved. The leaves feel jointed between the fingers, like those of J. acutiflorus. The plant usually arises from a curved base, not erect like J. acutiflorus. Flowers and fruit somewhat similar to J. acutiflorus.